Our party tents & canopies will always make your event special & elegant. A beautifully customized tent can help set the perfect mood & ambiance for the party that later on becomes the talk of the town, that cannot be matched in any other way. We make the Best Indian Party Tents. These are small Square shape peaked tents, with NO center pole, so it gives entire inner area for utilization. These tents can be made to erect on Bamboo poles or Folding Metal pipe Frame. The Frame version of these Tents can be erected on Hard Grounds as well. Canvas Walls can be put to close the Tent from all sides in Winters and these can be replaced by Voile Curtains during Spring and Summers to let in light. 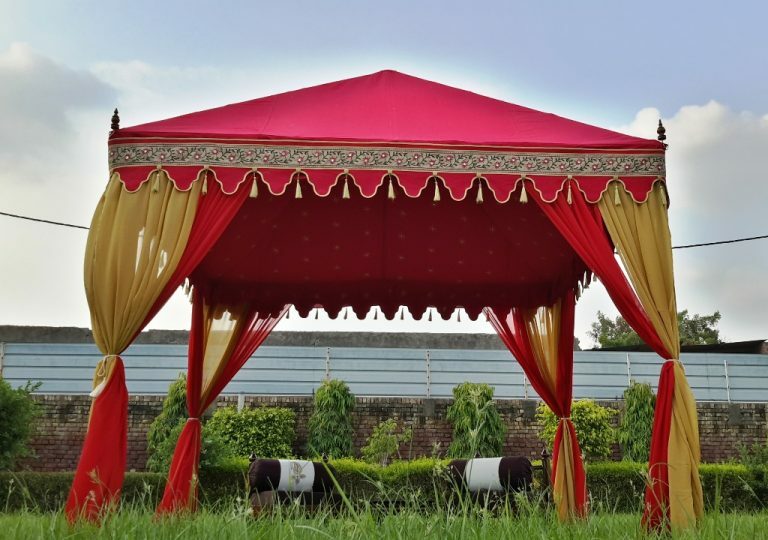 These are the Best Indian Party Tents. The tent top is made up of two layers of fabric, outer of water-repellent & rot resistant cotton canvas in Natural color and Inner of printed or plain cotton sheeting. Erected on Bamboo poles or Metal Frame, this tent has NO center pole. 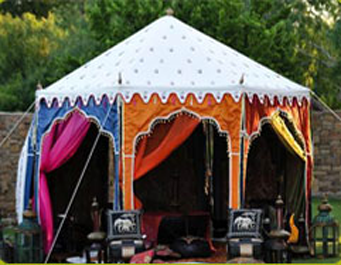 These are also known as Indian Raj Tents. These Luxury Wedding Tents make your wedding come alive with vibrant colors and hues from our very wide collection of Voile drapes and printed inner linings. You can customize a lot to create the right environment and mood for your wedding ceremony. Our extensive range of tents has big and small tents to breathe life and authenticity into your function. There are lots of themes and print options to make your wedding a Splendid One ! Voile pole drapes are hung around the side poles and can be tied with tassels and Tiebacks to complete the look of our Indian Tents. Our Frame Tent is erected on a folding metal pipe Frame with sockets. All standing poles have Base plates for more stability. It has NO center poles, hence full inner area for utilization. Making it easy to erect even on Hard grounds and concrete floors. Popular Uses : These Tents are mainly used as Party tent, Bar tent, Walkways and entrance tent, buffet tent for serving food, dining tent, Food Stalls, beach lounge tent, theme wedding tent, Moroccan cabana, and garden tents. Our Cupola Tents stand out at every venue, may it be a 5 Star Hotel Lawn or Ball Room interiors, Our frame tents do equally well for your event. You can have numerous combinations of White Canvas with Fuchsia, Green, Turquoise and Gold curtains, or Black Canvas with Red, Orange, and Pink Curtains, you can choose colors according to your Theme Wedding too. This Party Tent has two options, Canvas walls can be used in winters, to close the Tent from all sides. These Canvas walls can be replaced with beautiful off-white or colored Voile drapes on all sides to let in air and sun-light during Spring or Summers. This Pergola Tent comes complete with all accessories, Bamboo Poles, Wooden Pegs, Wooden pole tops, Cotton tassels with tie backs etc. Everything you need to erect your tent, comes with the Tent from us.